Last week, I wrote you about the power of the tarot deck, and how it is my #1 tool for getting answers to your biggest questions. The answers you seek are already inside you…you just need a way to draw them out! And, if you’re a yoga instructor (or work in a spiritual capacity with clients), then you know they ask you these questions and expect your help in getting the answers. Tarot is an amazing tool for supporting yourself and your clients in pulling answers from within that lead you in the right direction. I discovered this many years ago when I bought my first tarot deck in high school. Full disclosure: at the same time, I bought my first pendulum, too. I was not mystical…I was skeptical. I didn’t believe or buy into any of this nonsense, and yet somehow, still, I was drawn to these tools as a means to stop second guessing myself, increasing my intuition, and gain the confidence I was moving in the right direction. At the time, I would throw a few cards on the table, and furiously flip through the tiny book that accompanied the deck to try and figure out my fate. I’d tensely hold the pendulum and look for any wiggle in crystal at all. I actually feel very vulnerable revealing this to you! Maybe you’re a skeptic, but you’re just open minded enough to keep reading! After many years, tons of experience, heaps of research and study…I still don’t know how these things work, but I know They. Work. And, I know they work best when we are fully connected to our spirit. When we are connected to spirit, we enter something called flow state. Psychologists tell us that flow state is the condition of greatest joy, receptivity, creativity, and connection. Yeah. Let’s do more of that. Well, this week, I will teach you to do more of all of these things! If you didn’t take the time to register for the webinar I highlighted in the newsletter last week, make sure you do it this week. 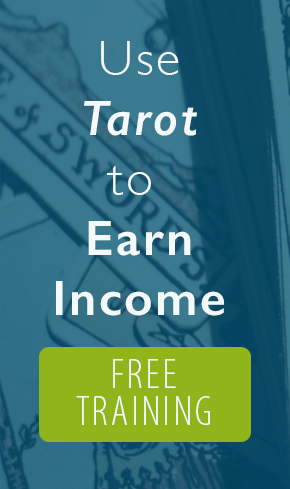 This webinar teaches you how to start working with the tarot, and also talks about the power of connecting to spirit (with a little bonus, too, *hint hint*). As yoga practitioners, it is really important that we diversify our skill set beyond just yoga, so that we are armed with the tools necessary to create transformation and support ourselves and client in their spiritual process. Mystics throughout millennia have done this–drawn on movement, healing practices, astrology, divination, ritual, and more–because they understood that as spiritual leaders, the responsibility is ours to do whatever necessary to elevate the souls of those around us (including our own)! On my Facebook Live we discussed the Mythology and Symbolism of the Tarot Deck and how our Western psyches play such a huge role in our interpreting the deck. I’m grateful and honored you’re with me on this path, and a member of my intimate tribe of #ModernMystics. I’m happy to have you here!